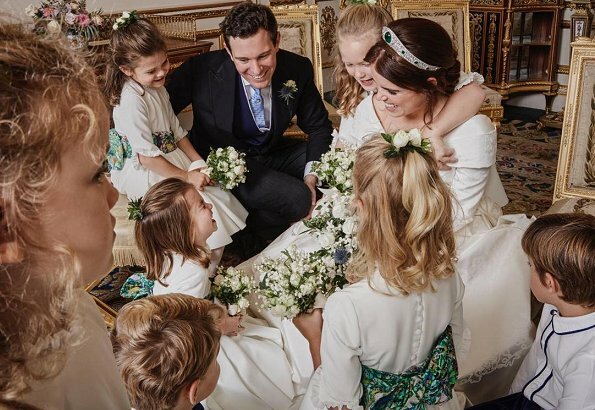 Princess Eugenie shared a photo showing the bridesmaids and page boys on her Instagram account and released a thanks message. In her message, Eugenie wrote "Jack and I would like to thank everyone who was involved in making our day so special and for all the wonderful wishes as we start married life laughing together. ".In the informal photograph, the bride is seen sitting on the floor on her wedding dress as Princess Charlotte of Cambridge, three, pulls a face at her in the White Drawing Room at Windsor Castle. Savannah Phillips, seven, meanwhile has her arms around Eugenie, as the other bridesmaids and flower girls watch on. What a lovely photo, as it captures the pure joy of the moment. This pic is a treasure really. Happiness all around. A very nice pic. Preciosa foto. Todos los niños fueron encantadores y vestidos con ropa española. Princess Eugenie seems to be very close to the children, princess Charlotte. They seem very confortable together. This is my favorite royal weeding photo ever, they look so happy and confortable with each other. Never saw Robbie Williams' little daughter before. What a charming and beautiful child! This is my favorite wedding photo. So genuine.